First and foremost, the oil and gas industries focus on safety. Every detail needs to be meticulously planned, checked, and triple-checked to prevent injuries and minimize strain on equipment — all while operating within the most challenging environments on the face of the planet. When it comes to erosion control within the oil, gas, and drilling industries, ECORASTER® products have a variety of safe, reliable applications. For example, the Ecoraster E50 can provide permeable ground stabilization for oil and gas companies in need of sturdy pump jack bases, storage tank containment support, dependable lease roads, and even drilling site stabilization. An affordable yet environmentally-friendly alternative to concrete, ECORASTER® interlocking grid systems are easy to install and will not crack when exposed to extreme temperatures. Ready to learn more? We don’t blame you. When it comes to erosion control and ground stabilization for Canada’s oil and gas industries, there’s only one distribution partner you can trust for the best prices and reliable solutions: B8 Ventures. Give us a call today to learn more or to place your first order. The oil and gas industry has long needed a solution for erosion control and ground stabilization in the harshest of environments. ECORASTER® mats are the perfect solution, With easy installation and convenient 3×4-foot grids, it’s both simple and practical to install the best erosion control solutions at your site. 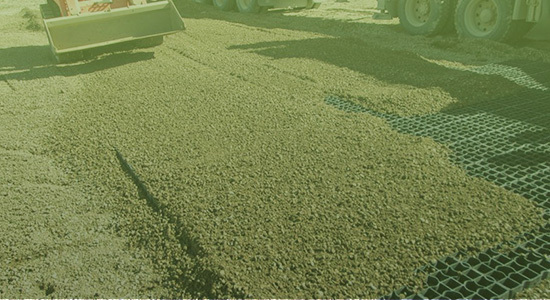 Plus, all ECORASTER® products are made from environmentally friendly materials, all while being durable enough to hold up to massive loads and harsh elements. Whether you need erosion control for your mining site, military operations, logistics area, or construction land, B8 Ventures has the solutions you can count on. Contact us today to get started with our world-class permeable erosion control solutions.